Nothing like being woken up by a radio station wanting to interview you (when I get the audio I will link it in here) at 5.45am. Good thing I am a morning person! Last week I got woken up by 3AW wanting to interview me about my services, naturally I said YES! It was only a two minute spot, but at that hour of the morning, at least I didn’t have time to be nervous, and yes Justin (the radio host), people DO put bow ties on their dogs. It’s very cute. I would love my dog to be at my wedding, what now? Congratulations! 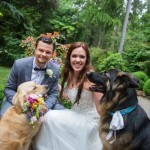 You are getting married and you would love your dog(s) to be part of your wedding day, but what now? Get in touch with us to arrange your free (yup, FREE!) consultation. We will meet with you and your dog(s) in your home so that we can do an assessment of your dog’s suitability to be part of your wedding day. This takes about an hour and a half and we discuss how you want your dogs to be part of your wedding day (as professional trainers and behaviourists we are able to easily assess dogs in an initial consultation). You can contact us easily by clicking here: I want to arrange my free consultation! After your initial meeting, if you decide to go ahead, we will arrange a quote or invoice for you. To book your date, a $200 deposit is required, with the balance not due until the week before your wedding. Once your deposit is paid, you are booked in! If your dog requires general training or trick training or behaviour training we will advise costs and time schedules. Q: What happens on my wedding day? A: A Formal Dogs trainer will attend at your home and collect your dog(s) prior to the wedding at an organised time, we will look after your dog and transport him/her to the wedding venue leaving time for a walk and play, provide drinks and toilet breaks until the ceremony is ready to start, and then we will help your dog to participate in your wedding as per your instructions. 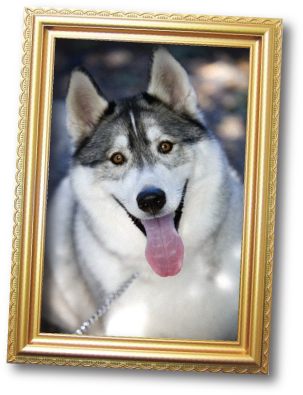 A: Usually at this point we will ensure your dog is in the photos that you want him/her in, and then we will transport your dog back to the pre arranged location and ensure he/she is secure and safe when we leave. We will send you a message to let you know your dog has arrived safely at the destination. Q: I notice you recommend having dogs at the wedding rehearsal, why? A: A wedding day is a big deal for people and it can be a big deal for dogs too. They have loads of fun, but it is a big day for them. Dogs are sensitive to change, and a lot is going on at home on a wedding day usually, then if they are taken to a new environment it can be a big thing, all those new and exciting smells to smell. So, if we have your dog at your wedding rehearsal we can familiarise your dog with the environment, as well as run through the details of where your dog will sit, who will hold him/her during the ceremony. In my experience (nearly 10 years now) the dogs who attend wedding rehearsals seem much more relaxed on the wedding day. So, I will meet you at the wedding rehearsal, and take your dog from there. You can concentrate on the wedding details and your dog can spend some bonding time with the trainer. Q: Will my dog have a good time? A: Yes! Most dogs love new experiences and that is what the initial behavioural assessment is all about, for us to establish that your dog will have a great time with all the new experiences on your wedding day. Sure, they will be tired, (all that sniffing requires energy!) but they will be happy tired and have had an awesome time. Q: What if my dog gets disruptive or upset? A: Your dog’s handler is also a trainer and expert in dog behaviour, if we notice your dog is getting distracted or disruptive, we will simply move your dog to somewhere it is more settled, we will have talked to you before hand about how we will minimise the chance of this happening and what we will do if your dog does become unsettled during the ceremony. So far we have not had to take a dog away from a wedding ceremony. Q: But my dog jumps on everyone! 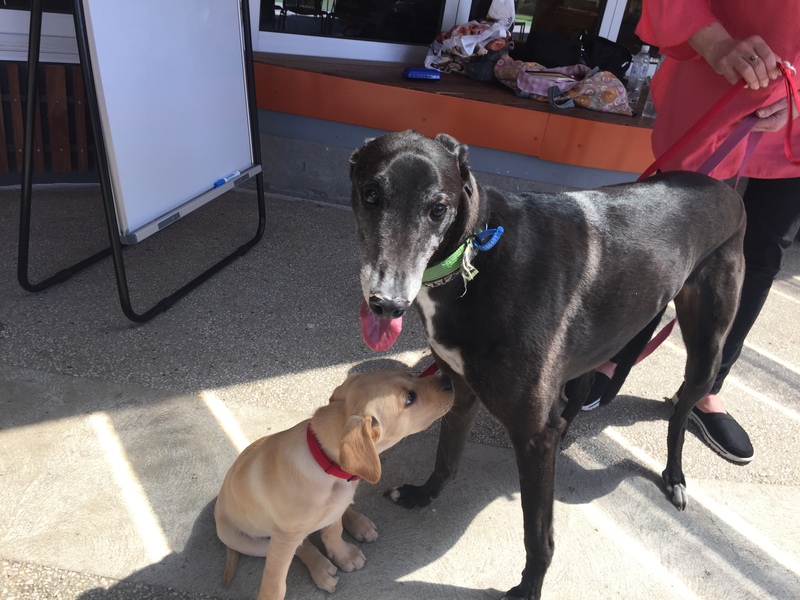 A: We are commonly complimented on how calm the dogs are at weddings, this is because your dog’s companion for the day is a dog trainer and behaviour expert, it is our job to keep your dog as calm and settled as we can. If you are worried about your dog’s behaviour, we can provide advice at your initial consultation on how to manage it. If you have any questions about your dog at your wedding feel free to ask. We are the premiere service, and happy to answer any questions for you. 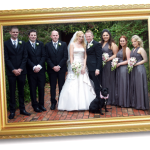 We also carry specific insurance to have your dog transported and be a part of your wedding day. 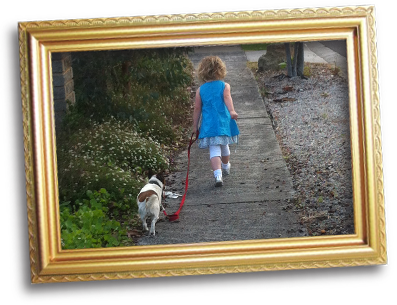 As a Mum with a young family, I know first hand what it is like to manage dogs and children, fortunately, with good training, walking dogs with young children and a pram, or letting the older children help with the walking are things that are part of our normal life. The kids can play in the backyard without being knocked over by an over exuberant dog, or jump on the trampoline without trouble. We also have our dogs in the home with the kids, however, supervision is always first and foremost, dogs and children can make mistakes. If you need help with preparing your dog for a new baby, or already have children and dogs, here are some basic tips for you to follow. Preparation – think about any issues you have with your dog and get help to resolve them before baby arrives. Labour/Birth – some women can labour for a long while (it’s ok – you can do it, you will be great!!). If you will be in hospital during your labour, or staying for a few days after birth, do you have someone who will help walk and feed your dog while you are away from home or do you need to organize this? If you are having a homebirth – is there another member of your household or a family member or friend who can help out? 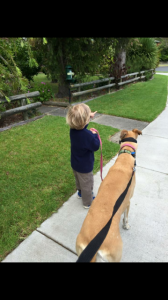 Routines – quite often our dogs are used to a set routine. Babies and household routines don’t always go to plan and it can take time to settle or feed a baby. Start varying your dog’s routine in the lead up to baby and see how your dog adjusts to getting walked or fed at different times of day. If any issues arise from these changes to routine, you will have time to address them. Training – A well trained dog is much easier to manage when out and about with your baby, but it doesn’t happen overnight. Start by teaching your dog a simple sit command and asking your dog to hold that command for a minute or two, and working your way up to a reliable drop and hold under distraction is great. Sleeping arrangements – at some point, the studies tell us, most new parents will bring baby into bed with them. This is not safe if there is an animal in the bed. If your dog is sleeping in your bed you can help your dog to learn that it is ok to sleep on a special dog bed on the floor, or in another room, before your baby arrives. Only being allowed onto the bed when invited (or not at all) means that you won’t be trying to teach your dog this change while you are caring for a new baby. If you already have children, it is never too late to implement training and behavioural modification for your dog and these tips are a great place to start. Talk to us about how we can help you to help your dog be confident and happy at home!